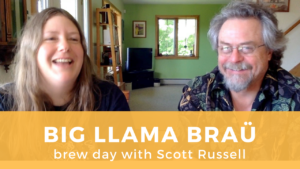 Join us for a behind-the-scenes preview as we brew Big Llama Braü, a double IPA recipe developed exclusively for Gage Hill Crafts by the Homebrew Guru himself, Scott Russell. This big New England-style IPA has a boost of hop aroma and flavor balanced by local ingredients. Vermont has a variety of flavors to offer the adventurous brewer who is looking to add some local character to their beer. In this recipe, Scott features pure maple syrup, spruce tips that he harvested from his own land, and a Vermont maple spirit for a barrel-aged touch. While the vintage Tamarack Liqueur is no longer made, you can use any maple bourbon or cordial, such as Metcalfe’s Vermont Maple Cream Liqueur. To get the full all-grain recipe for Big Llama Braü, just subscribe to our monthly newsletter. For more Gage Hill Crafts beer recipes check the archive.